While SaaS solutions are akin to paying rentals every month, desktop solutions are in-house properties created specifically for a certain enterprise. Microsoft’s Office Web Apps is a great SaaS example. The Office Web Apps offer a remote space to access documents from anywhere. A practical and cost-effective solution for every enterprise, it stores files in OneDrive, allows real-time editing and has global sharing options. Another good example is Mozy, one of the first cloud backup service providers. It offers 2 GB free storage and allows storage of various data formats. Another similar service is Dropbox. On the other hand, desktop solutions are turnkey solutions to meet the certain specific organisational purposes. A case in point is how TCS and OEM IT team of Microsoft worked in tandem to automate and integrate Microsoft Visual Source Safe ® using Visual Studio 2005 Team System with the purpose to enhance team collaboration and productivity. 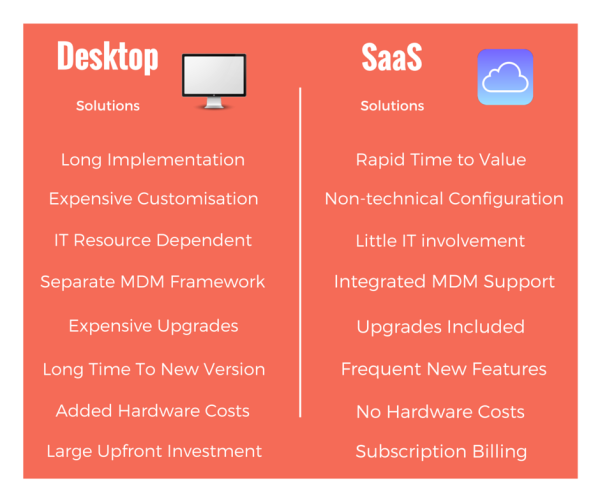 Both SaaS and Desktop solutions have its advantages and disadvantages, which is summed up in this graphic. Since 2000, it has been a mainstream business solution with Salesforce being its poster-child. Salesforce is the USA-based Customer Relationship Management (CRM) solution powering businesses since 1999. Let’s take Salesforce as an example SaaS solution for a SMB enterprise. The Salesforce CRM helps the SMB with optimal asset allocation and management, nurturing employees and customers, with latest technology. It’s low cost – there’s no need of upfront investments on software and hardware development. With Salesforce, the SMB can manage sales, offer stellar customer services, build a community, monitor revenue and communicate internally – all on one platform which is available to the SMB for a monthly fee. These outlined services almost cover the necessary requirements of a SMB. In contrast, if the SMB were to build a custom desktop solution for the organisation, the upfront development costs will be more than what would be paid to Salesforce for the next 2 decades! 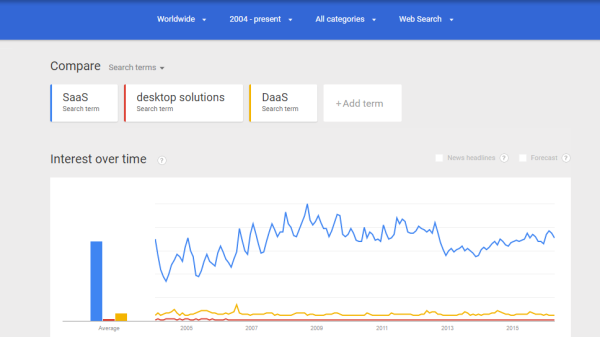 Here is a graphical representation of interest in SaaS services versus desktop solutions or desktop-as-a-service (DaaS) over the last decade 2005-2015. The graph clearly shows a heightened and continued growth in SaaS, and the almost non-existent demand for DaaS. A major plus factor. SaaS eliminated the need of expensive capital investment necessary for developing, installing and maintaining a DaaS. SaaS is subscription oriented and value for money with its innumerable features and integrations. The necessity to provision internal resources is eliminated such as software installation and API tracking. With a SaaS, the time to generate a workable solution reduces from months to days and hours. The software application is pre-configured and pre-installed. It allows for prototyping and rapid demonstration since most SaaS offers free limited period trials. Highly integrated applications with complex connections to systems may require a substantial migration investment, resulting in reduced benefits. Therefore, applications with standard and complex interfaces are easily integrated with SaaS cloud systems. There are APIs to allow connection with internal CRMs, ERPs, and other SaaS vendors. SaaS applications are scalable as it doesn’t involve investment for software licenses and service capacity. Acts of nature or any accident won’t ruin the enterprise as its IT infrastructure is safely stored in the SaaS cloud. The data is remotely accessible globally with internet connectivity. Even in case of natural disasters or otherwise, business will be up and running 24 x 7. SaaS solutions offer a “pay as you go” model – the pricing model depends on the provider. It could be a monthly, half-yearly or a yearly subscription. Due to this, if the SaaS users need to upgrade or scale up further, there will a clear idea of additional costs and as such, it leads of better budgeting. The SaaS delivery chain usually follows this pattern. A major concern with SaaS is its security measures because all the business data is practically entrusted into the hands of a third-party service provider. Therefore, it is essential to use trusted SaaS providers like Salesforce, RankWatch and ZOHO. Additional security measures like encrypted log-in, SMS password verification, security certificates and management control are implemented for heightened security measures. SaaS enables an enterprise to achieve higher productivity through integrated implementation of applications and analysis. Given the affordable cost of SaaS as compared to simply developing a DaaS, the SaaS solutions provide better ROI and therefore, it has higher adoption rates. It is accessible via multiple web browsers and there is a lower learning curve. Entry into SaaS is low cost. Note – Unless it’s an extremely huge organisation with specific needs for which SaaS solutions aren’t yet available or partly available whose implementation complicates business operations, it’s better to opt for custom desktop solutions or Enterprise Resource Planning (ERP). 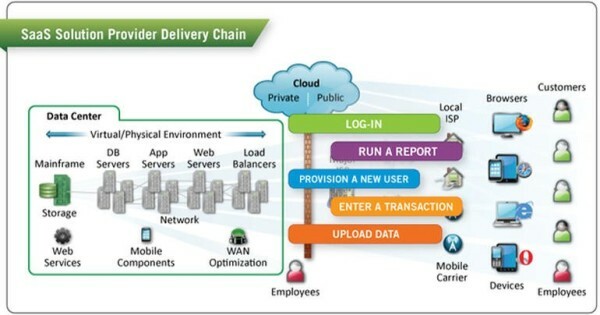 90% of mobile data traffic will generate from cloud applications by 2019. Current traffic is 81%. The growth rate of global SaaS market is projected to go from $49 billion in 2015 to $67 billion in 2018, a CAGR of 8.14%. Amazon Web Apps (AWS) is the preferred destination for 57% of technology professionals to run apps. Spend on Infrastructure-as-a-Service (IaaS) is $16.5 billion for 2015 and is projected to increase in the subsequent years to $34 billion, a CAGR of 10.27% by 2018. Platform-as-a-Service (PaaS) providers like Amazon will grow to $68.3 billion in 2026 from $1.7 billion in 2014, a CAGR of 36%. The current PaaS leaders, according to Wikibon Research, are Amazon, Salesforce and Microsoft. There is a 50% higher chance of enterprises adopting cloud-based applications to boost customer demand if they are experienced with cloud computing. The adoption of private cloud servers decreased in UK (7%) and France (6%), according to Forrester Business Technographics data. More key insights can be found here. These data and statistics highlight the role SaaS and associates (PaaS, IaaS and others) play in modern businesses. SaaS is a profitable, manageable and ROI-oriented solution for a SMB. The benefits of SaaS solutions attract businesses across all verticals.